A blog begun in 2011 by a handful of Canadian-Americans, who back then were becoming increasingly frustrated by the American government’s intensifying efforts to come after them for such transgressions as unpaid taxes and failing to file tax returns, has become a much-used source of information on the Foreign Account Tax Compliance Act and other US-citizenship-related matters around the world. Until sometime around 2010, maybe 2011, few American expats thought the business of being an expatriate was itself a major problem. Many went abroad to study or travel; put down roots, married, and at some point, often became citizens of the country they were living in. Then the US tax authority, the Internal Revenue Service (IRS), began to crack down. It started enforcing a little-known requirement for Americans to report on any foreign bank accounts they held, and the amounts in them, known as FBARs (Foreign Bank Account Reports), and began making becoming an American expatriate more difficult, and expensive, to be. Frustrated, baffled and in some cases, increasingly angry, many expatriate Americans began turning to the expat blogosphere for support, to vent, and to seek advice. It was from this environment that IsaacBrockSociety.ca began to emerge in late 2011, as the website of choice for the frustrated, mad-as-hell-and-don’t-intend-to-take-it-anymore, expat-American-living-in-Canada blogger. The Isaac Brock Society had its origins in another online forum for expats, ExpatForum.com, which still exists, and which still hosts comments about American expat issues, its founders say. It was here, these Canadian-American dual citizens and renounced-American citizens explain, that they first found one another, as their shared shock, frustration, anger and disbelief grew, over what they saw as heavy-handed tactics by the US to come after them and other “innocent” Canadians. Canadians who, they say, for example, hadn’t realised that the fact of their having spent their first 48 hours in a US maternity ward meant that they would have potentially significant US tax obligations for the rest of their lives, unless they renounced a citizenship that many didn’t even realise 48 hours spent in a hospital south of the border meant they had. Patricia Moon, an Ohioan who moved to Toronto in 1981 to be with her Canadian husband, recalled that for her, the seeds of Brock activism had been “sown one day when a post I’d written [for ExpatForum] was deleted”, apparently because of its controversial nature. “Petros” – the pen name of the main founder of the Isaac Brock Society website, Peter Dunn – “was kind enough to write me and ask if I was okay”, she added, in a 2014 Brock posting in which she marked the Isaac Brock Society’s third birthday by recalling its founding. At that point, Moon wrote, she was still “a complete newbie to the whole world of posts, comments and public banter”. But she says she and others were drawn together, and simultaneously driven to create a new forum, out of a shared sense of outrage over a number of issues having to do with America’s efforts to tap into what it evidently saw as an under-utilised source of tax revenue – its own expats. Because the US taxes on the basis of citizenship – the only major country in the world to do so – the only way an expatriate American can ever escape their US tax obligations is to renounce their citizenship, a time-consuming and, lately, increasingly costly business. 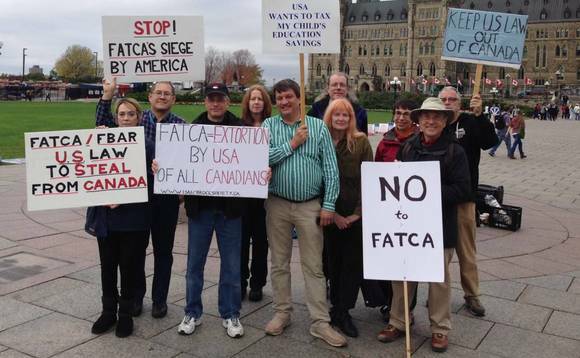 Dunn, pictured above with nine other “Brockers” at an anti-FATCA demonstration in Ottawa in 2013, says that for him, as for many other of the blog’s founding members, the move towards Brockism had also begun years before FATCA was even signed. “For me, my issues [with the US] started years earlier, in 2008 with the [then-new] exit tax,” says Dunn, a native of Anchorage, Alaska, who married a Canadian he’d met at university decades ago. He is now based in Toronto. “As someone who had lived outside of the US for more than two decades, I didn’t feel that I owed the United States anything,” Dunn recalls. By the end of 2011, Dunn and his fellow Brockers had launched their blog/website. As it happened, www.isaacbrocksociety.ca hit the international blogosphere at almost exactly the same time that much of the world was waking up to FATCA, and its implications for non-US financial services institutions and American expatriates alike. While FATCA may not have been the initial reason the Brockers launched their blog, it gave the site and its contributors a powerful additional subject to address. Officially enacted by the US government as part of an effort to crack down on the use by US-resident Americans of non-US financial institutions – such as Swiss banks – to avoid their US tax obligations, FATCA obliges such non-US institutions to report to the IRS on any accounts held outside of the US by American citizens that are worth US$50,000 or more. One of the reasons FATCA and some of the other new, expat-targeting US regulations hit Canada-based Americans so hard was because so many of them were, and still are, what are known as “Accidental Americans”, or “Accidentals”, and thus were unaware of their tax obligations until such things as FBARs and FATCA came into their lives. This meant that many found themselves owing significant sums of money in penalties for having failed to file such documents as FBARs, and, in some cases, any tax returns at all. At the same time, banks and other non-US financial services institutions began showing the door to clients who turned out to be American in order to avoid having to comply with the reporting requirements FATCA imposes on such institutions when they look after Americans. Few people outside of Canada are likely to immediately recognise the name of Isaac Brock. But in Canada, the long-dead British military general is remembered as a hero, and is still well enough known for there to be places named after him – including a university in Ontario – and a couple of statues and portraits bearing his name and likeness scattered about. His name even appears occasionally on lists of great Canadians. Sir Isaac was actually born in Guernsey, in 1769, where his childhood home in St Peter Port still stands, (occupied in part by a Boots pharmacy, and marked with a plaque). 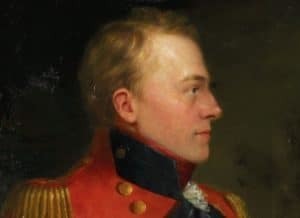 As noted above, the Canadians who founded the IsaacBrockSociety.ca blog chose to name their website after him because he is remembered for having played a key role in keeping US forces from invading what is now Canada, in 1812. In particular, “while everybody else in the British army was denying that war with the Americans was going to take place, he saw that it was coming, and began preparing for it,” says IsaacBrockSociety.ca co-founder Peter Dunn. Sir Isaac’s success on the battlefield, where he ultimately died in 1812 at the age of 43, resulted in his being awarded a knighthood as well as an Order of Bath military distinction. He has been remembered periodically ever since. In addition to the towns and institutions named after him and the various statues, he’s also been featured on postage stamps in both Canada and Guernsey. For a blog that neither advertises nor accepts advertising, IsaacBrockSociety.ca enjoys a loyal following, according to Dunn, who says it has had periods when page views reached upwards of 8,000 a day. At the moment it’s running around 4,000 to 5,000 a day, he adds. In addition to being a place where expats post comments, queries and news about FATCA, FBARs, renunciation issues and so on, the website has also featured some heart-wrenching stories of people damaged by FATCA and some of the other American offshore initiatives. One such story was a posting, made in 2015 on behalf of an anonymous Canadian farmer’s wife by a regular Brock contributor, which took the form of a letter to President Obama. It detailed this particular family’s hardship in the wake of the discovery that the farmer was an “Accidental”. Thus far there are 73 responses to the posting below it, some of which are detailed explanations of similar situations. Another posting, earlier this year, also written in the form of a letter, was amusing rather than heart-wrenching, although it made a serious point. It was supposedly written by an eight-month-old baby named Elle, born in the US to Canadian parents and now living back in Canada, who wanted to know why the Canadian bank in which some relatives had opened a savings account for her wanted “information about me”. “What’s FATCA?” Baby Elle asks in her letter. Some observers in the American expat advisory space, particularly if they happen to be American, say that sometimes IsaacBrockSociety.ca can sometimes seem a little too anti-American for comfort. Also, “like all such blogs, the information that gets posted or commented on can lead to inaccuracies”, one person in the expat American world, who requested anonymity, points out. Nevertheless, many find it a useful starting point for picking up breaking news and insights. And if some of its contributors come across as extreme, notes Thun Financial Advisors’ founder David Kuenzi, it is perhaps not so very surprising, given that “Canadian-Americans in Canada feel more betrayed by the US system of citizenship-based taxation than any other expat group, because so many [of them] get caught up in the trap set for them, because of the deep family and geography connections between Canada and the US”. “The innocence of their intentions leaves them especially bitter when confronted by a US tax code the starts from the assumption that they are likely to be tax cheats,” he adds. This article first appeared in the November issue of International Investment magazine.